Village CEO Travis Doherty and Queanbeyan Mayor Tim Overall: “A significant milestone for the project .” Photos: George Tsotsos. 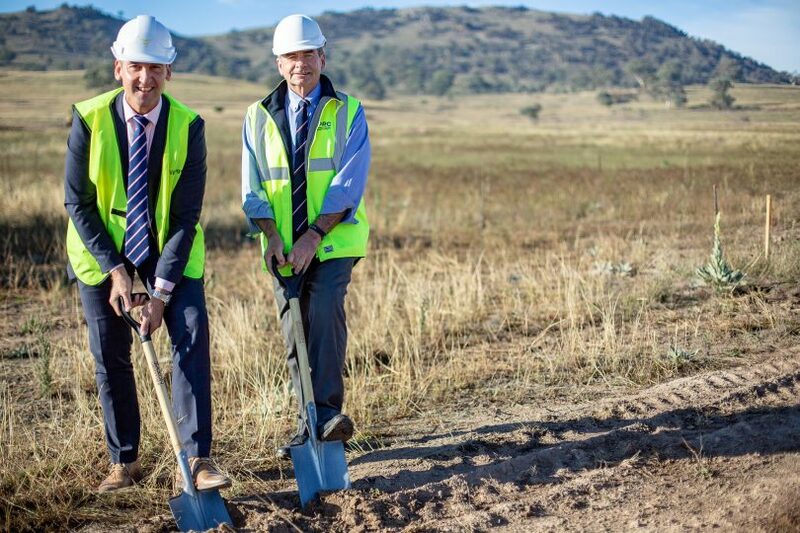 It’s been a long time coming but Village Building Company has finally broken ground on its housing development just across the border from Hume at South Jerrabomberra, formerly Tralee. At a formal sod turning ceremony on Wednesday, Village CEO Travis Doherty said it was no secret that the project had been complex and challenging, alluding to the long-running battle with Canberra Airport over flight paths, and the torturous multi-jurisdictional planning path. It’s been a long time coming but the first sod for South Jerrabomberra has finally been turned. It’s a huge step for the Queanbeyan region, with the new development to include state of the art regional sporting facilities, a high school, and an innovation hub, as well as 1250 homes for more than 3000 people. Click to hear more about the exciting new estate. 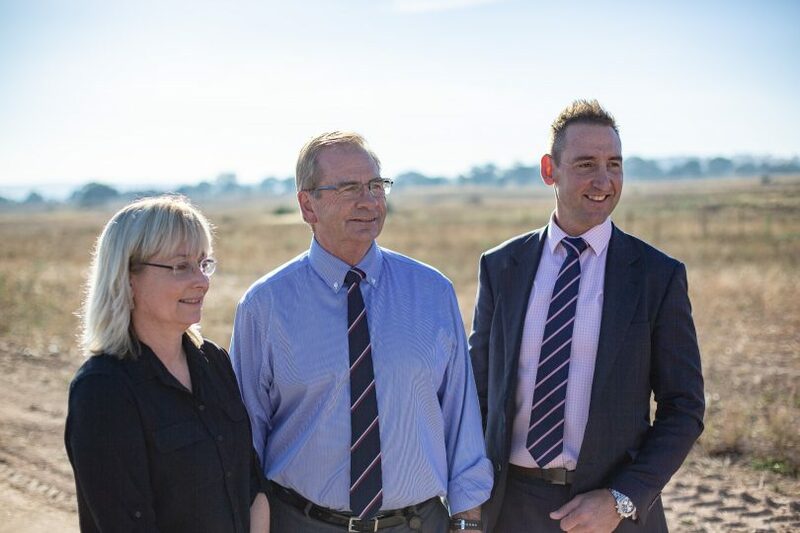 But almost two decades after former CEO and founder Bob Winnell first began planning the development, the ground is being prepared for Stage 1a subdivision works to commence mid-year for an 18-month build. Mr Doherty said the entire estate, to be developed over the next eight to 10 years, would comprise a mix of 1250 homes, with the initial stage delivering 200, of which 80 had been sold. He said that overall three quarters would be traditional detached single residential homes, with the rest terrace and town houses. Village see this housing mix as a gap in the market, and with ACT land expensive and the Territory seemingly focused on apartments there is high demand for affordable house and land packages. Lots ranged from 370 square metres up to almost 800 square metres, with prices starting at $325,000 to beyond $450,000. The first stage would be mostly smaller lots, with the size increasing in subsequent releases at higher elevations. Mr Doherty said Village already had DA approval for 600 homes. Mr Doherty with a model of the estate. He welcomed the NSW Government’s commitment, through local member and Deputy Premier John Barilaro, to the South Jerrabomberra region, where it will fund state of the art regional sporting facilities, a high school, an innovation hub and a northern access road to unlock that infrastructure. “That makes South Jerrabomberra a highly desirable place to live and work and over the next 10 years well be creating 1250 homes where more than 3000 people will live,” he said. He expected the first residents to start moving in by early 2021. A 200 metre landscaped buffer zone will separate the estate from the border and Hume’s industrial area, while the hilly area behind has been set aside for the environment and recreation, with walking and mountain biking trails envisaged. The old woolshed on the site will be re-purposed into a Neighbourhood Centre. Mr Doherty said the ground breaking was a significant milestone for Village and a tribute to the determination shown to persist with the project. “A project of this magnitude, that straddles the NSW-ACT border dealing with multiple jurisdictions and multiple levels of government, is inherently complex,” he said. Queanbeyan and Palerang Mayor Tim Overall said it was a significant day for Queanbeyan’s development. “This forms a key element of our residential and economic development strategy which was approved by the NSW Government going back 12 years now. It’s had its issues with predicted flight paths but now we’re in a position to go ahead with the project. He said the area was important to Queanbeyan’s urban planning, particularly with the community infrastructure the NSW Government had promised. It was all connected directly into the Jerrabomberra community through the northern entry road, with linkage to Queanbeyan. 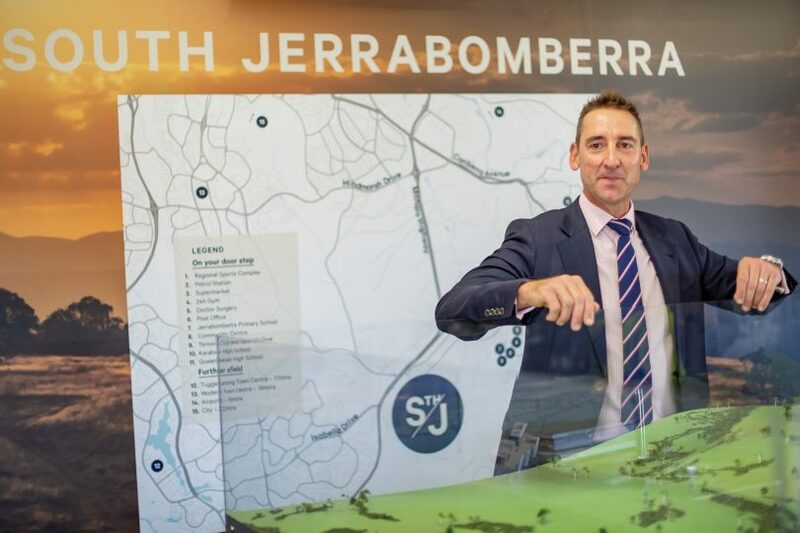 Jerrabomberra would be the community’s obvious place to shop particularly with a new commercial development under way that will include more retail and restaurants. He said the Council was looking at a further 250 homes in the valley eventually, which would mean a community 4000 to 4500 strong. Jerrabomberra Residents Association president Margot Sachse, with Mr Doherty and Mr Overall. Jerrabomberra Residents Association president Margot Sachse said the Association had been fighting for nearly 20 years to get development in this valley. “We see this as a way to provide community facilities for Jerrabomberra as well as South Jerrabomberra,” she said. “We have worked with Village trying to find a solution to development in the valley and to give us our sports precinct but also the high school, which is desperately needed in our area. Am just wondering about access to the Monaro Highway from this site.. The last time I was out there to have a geek ( a few years back ), you accessed the place through a Hume street lined with light industry. Not a real salubrious entrance. And 1250 homes, might mean 1250 cars all heading to Canberra for work at near the same time. Is the Monaro up to that ? Light rail opportunity? The track is already there. Let’s hope that there are lots of single level townhouses being built there to suit downsizing retirees because there aren’t any in Canberra. You’d be nuts to buy here. Nearly under a flight path, siding up to an industrial zone (Hume) and the only access road joins into an already busy road that council is already making more busy. Don’t take my word, come and have a look for yourself. Qbn council supporting overdevelopment again. One wonders why (but not for long).